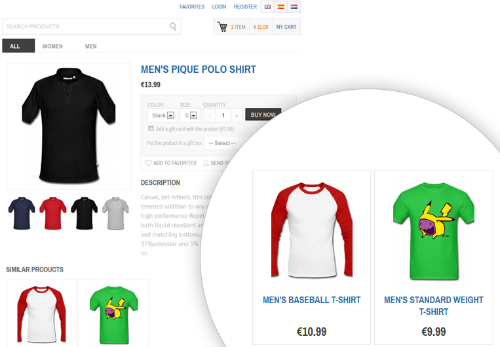 Ready to use a multilingual online shopping cart to help you build eCommerce websites and platforms. The shopping cart script has responsive front-end design and is optimized to be used on multiple platforms - mobile, tablet or desktop. You don\'t have to worry if you need to use the PHP shopping cart on any platform.The STIVA Shopping Cart is just the perfect combination of a simple shopping cart script and a powerful e-commerce system that will increase sales and convert visitors into buyers. The script allows you to mange products and stock availability via a combination of item attributes (colors, sizes,etc.) and add unique images for each combination. In addition to that you have powerful gallery controls which allows you to resize and crop images directly from the shopping cart admin, insert watermark, compress the images and more. Moreover you can assign similar products and sell digital productsuch as music, video or software. Multiple payment options and gateways are available – Paypal, Autorize. NET, credit card collection, bank account and cash on delivery. Additional modules such as voucher system, invoicing and a backup are also available. Also with the STIVA Shopping Cart you don\'t have to worry for search engines - turn SEO friendly URLs on with a click of the mouse and follow the instruction for creating htaccess file and meta content. Easy checkout page ensures a positive shopping experience for your customers - auto shipping and tax fulfillment, address book and simple registration. The STIVA Shopping Cart script is offered under two licensing options – user and a developer-friendly license which allows you multiple installations and modifications. Set up your magento online hotel booking with amazing features. This online hotel reservation software has unique properties that makes hassle free hotel booking for your customers.